In Volume #18, Roman will teach how to use blitz and rapid chess to improve your chess game and tactics. Roman also teaches you inside information on how to maneuver and defeat your chess computer, putting you in control of the game. There is little information on how to improve your Blitz Chess game. Roman has had a blitz rating as high as 3450 on the Internet Chess Club and will pass his knowledge on to you on how blitz is played on the highest level. He recommends ideas and openings to improve your Blitz game which will also help you improve your over the board skills. 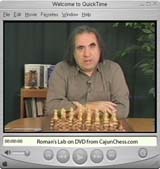 When it comes to Secrets in beating your Chess Computer Programs, Roman is one of the best Grandmasters. in the world and has even helped programmers improves flaws in their own programs. Computer Programs can look at millions of positions a second. Roman recommends and gives you ideas on how to give your computer positions where there is nothing to calculate. This will help you level the playing field, since most humans understand weak pieces and closed positions better than computers. Roman will help you with a plan to exploit these weaknesses.